$3900 (1/2008) . . . 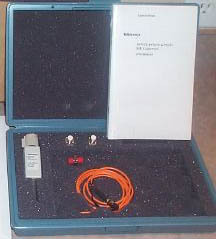 The Tektronix P6700 Series optical-to-electrical (O/E) converters change optical signals into electrical signals for convenient analysis on Tektronix TDS500/600/700 Series oscilloscopes equipped with the TEKPROBE interface, or any other oscilloscope when used with the 1103 TEKPROBE power supply. The P6700 Series O/E converters are ideal for optical source characterization in the development, manufacture or service of optical communication systems and devices.